Graeme McDowell is still in with a chance of making the third leg of the FedEx Cup play-offs. Picture Fran Caffrey www.golffile.ie Graeme McDowell eagled the 18th from just eight feet to keep his hopes alive of qualifying for the third leg of FedEx Cup play-offs. But Padraig Harrington could need a closing 67 to avoid an early exit. Ulsterman McDowell shot a one under 70 to slip to tied 39th on four under par entering the final round of the Deutsche Bank Championship at TPC Boston. But he has still has a realistic chance of finishing inside the top 70 points earners who qualify for the BMW Championship in Chicago. Ranked 84th starting the week, McDowell is projected 73rd as things stand, which means he might yet book his ticket for Chicago if he can move into the top 30 on the leaderboard on Monday night. But it’s a slightly bigger ask for Harrington, who again played the par-fives in one over par as he matched McDowell’s 70 but failed to undo all the damage of Saturday’s 73, climbing just one place to 60th on the leaderboard. Ranked 80th in the FedEx starting the week and needing to finish around 35th in Boston to be sure of progressing, Harrington has slipped to 87th in the projections and at one under par, he could need to shoot at least a four under par 67 in the final round to have any chance of remaining in the hunt for the $10m FedEx Cup bonus. He opened brightly with a birdie from six feet at the first but he had to get up and down from 93 yards at the second to save his par five after visiting water with his approach. After getting up and down from greenside sand for par at the third, Harrington bogeyed the 600-yard seventh for the second time in three days when he drove into sand, splashed back to the fairway but then found more sand near the green. He then missed birdie chances from around 10 feet at the 10th and 11th but birdied the 12th from 12 feet to get back into red fiigures for the day. After missing two more birdie chances at the 13th and 15th, Harrington overshot the par-five 18th but could find the green with his third and ended up having to hole a five footer just to save par. Left hander Bubba Watson (70) leads by a shot on 11 under from Jason Day, Brendan Steele, Chez Reavie, Jerry Kelly and Adam Scott. 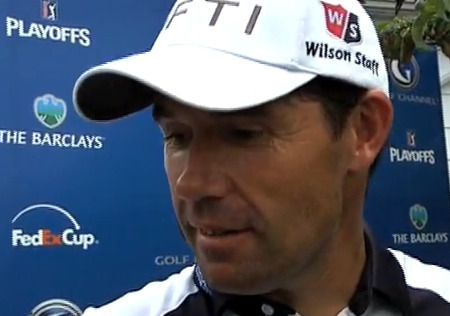 Padraig Harrington has made a fine start in The Barclays. Picture by golffile.iePadraig Harrington made a flying start to his bid for the $10m FedEx Cup in the weather-delayed Barclays at rain-softened Plainfield Country Club in Edison, New Jersey. The Dubliner appears to have had a eureka moment in the town where Thomas Edison invented the lighbulb, firing four birdies in an immaculate, opening 11 holes to get to within three shots of the lead in the first play-off event. Graeme McDowell and his caddie Ken Comboy won’t be at Sherwood Country Club this year, Picture by golffile.ieGraeme McDowell has enough on his plate trying to survive another week in the FedEx Cup play-offs without thinking about the end of November. Nevertheless, if he could get hold of Tiger Woods he’d tell him directly that he won’t be defending the Chervon World Challenge title he stole from under the host’s nose at Sherwood Country Club last year.